Some men are hard to quit. Evan O'Donnell's girlfriend took off when their baby girl was a month old, and that's just fine by him. His daughter Gracie is all the female companionship he needs, thank you very much. Beth Schaefer's not even in the running. Eight years ago, her parents convinced her to give him up, and he's had enough of snobs and women who don't stick. Evan's a blue-collar guy from his too-broad shoulders to his scuffed work boots, and he's nobody's white knight, and nobody's hero. Not anymore. But what if Beth isn't the only one who needs saving? I found Beth hard to like, especially at first. Admirable, yes, but not so likeable because who is she, really? This story has to move fast because she's on a short timetable, but that works because of their past history and the small town make it hard not to know what someone is like. Beth eventually peels off the layers of herself that don't fit and does become more authentic. She was really a hometown girl at heart, too. She and Evan have to get past their past and figure out if they have a future together while also juggling career aspirations plus assorted family members. I received a free copy of this audio book in exchange for an honest review. I already had the ebook. I was not compensated for my review, and I was not required to write a positive review. The opinion expressed here is my own. I loved this series glad it was audio because I wouldn't have gotten anything done if it where paperback. 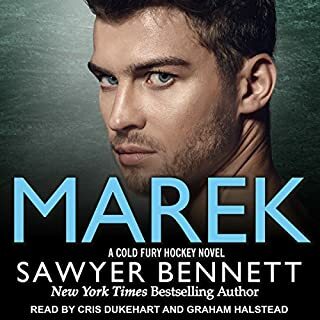 This is the 2nd book of the Portland Devils, and it’s slow and boring. The first book was great but not so much with this one. I liked the 2nd book better then the first this book had twists and turns all the way to the last second. I normally can guess guess what's going to happen in a movie or a book but this one kept throwing me it was good till the end. this story is dragging and the heroine is beyond annoying. the 1st book in this series was much better. 3 hours in and I have to call it quits. so boring. the narrator is cool and the hero is awesome. The second book in the series is more in line with Rosalind James other books. It’s lovely to hear Evan and Beth’s story. You So want them both to be happy, and it feels good watch them find their way to each other. Evan is such an incredibly good guy - you’ve got to read book 1 to really understand. Eby does a decent job of narration. we were introduced to Beth and Evan in the First book, and the pain of their story was felt for those moment. In No Kind of Hero the back story ist told and the future is experience. this is a very well writing book and the narration was excellent as usaual. I do recommend this book for others that like a HEA. This is book 2 but like all Rosalind James books, you don't need to read book 1 first. I loved the main character, Evan. I had a harder time relating to Beth, I really don't have anything in common with her other than loving her dog. Despite that, she is a well developed character that I enjoyed following. I also love the small town setting, it reminds me of where I grew up. As with all stories by this author, the characters and story line are beautifully written. I cried, laughed, and got all hot and bothered within the 1st 1/3 of the book. She is a master at emotional writing! I am super picky about narrators, but I liked this one well enough. She isn't my favorite but she is still good enough to keep me listening. &quot;No Kind of Hero&quot; was very enjoyable to listen to - I loved the story of Beth, a high-powered career woman jumping off the train to return to her hometown and reconnecting with a former love. Of course, the fact that she goes back to her hometown to have a &quot;breakdown&quot; is what leads to her finding her ultimate contentment, and to the realization of the love she wants to claim. Evan is a powerful character, and is doing everything that he needs to do to keep his life as a single father on track. These two share a history, but would probably never have made it until they each went through their own struggles to transform into the people that they are now. There are some twists that make for a powerful story, and I really enjoyed the narration by Tanya Eby. 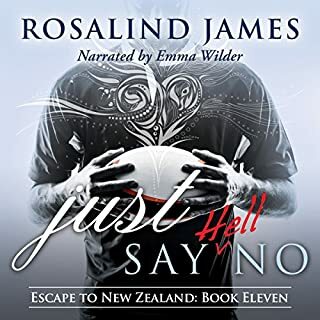 No Kind of Hero is the second in Rosalind James's Portland Devils series. It is also completely stand-alone. I thought this was an excellent follow up to the first book in the series and effective delved dive into the drama and story that was hinted about Beth and Evan. I think this book will have a broad appeal as it really hits a number of characteristics that would be of interest to readers. These include professional dilemma for Beth, first loves, conflict between a daughter and a parent, love of a parent and an adorable young daughter, steamy romance, a sensitive handling of troubled characters, and more. I loved the setting which is both a nature lovers paradise and filled with small town drama. Also, with what is a true James trademark, the secondary characters don't get short shrift. I found Beth's mother, while not likable, interesting and fleshed out to be more than a mere caricature you might find in another romance novel. I have a tendency to believe, that in many cases you are drawn to certain books, premises, or characters based on things you have experienced in your own life, big or small. I find that I am often drawn in this way to many of James's books. I think it is a great testament to James's storytelling, that even when not drawn to the characters on this personal level, I am always fully invested and interested in them and the plot as it unfolds and find the book difficult to stop listening or reading to. 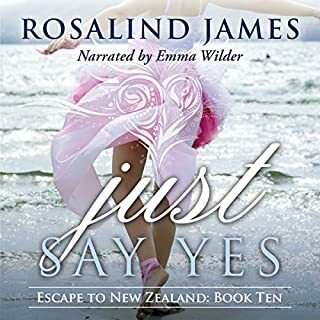 In short another great listen by Rosalind James. Additionally, I enjoyed Tanya Eby's narration. She has great vocal characterizations, pacing, and clarity. I was given a free copy of this audiobook in exchange for an honest review. I was not required to write a positive review, nor was I compensated in any way. The opinions stated are solely my own.